Considering how vital flame-resistant (FR) fabrics are in protecting workers in hazardous environments, there is a great deal of misinformation and marketing hype surrounding the topic. Both workers and employers need assurance that the protective garments they choose provide a high degree of safety and flame resistance. Flame-resistant fabrics must meet government standards called out in 16CFR Part 1610, and OSHA’s General Duty clause places the burden of identifying risks and providing appropriate protective clothing on employers, so it’s important to understand the facts about flame-resistant fabrics. 1. Proven FR fabrics should resist igniting and spread of flames. While all natural and most synthetic fabrics burn if untreated, FR fabrics resist igniting except for under the most extreme conditions. When they do ignite, they resist burning away from the ignition point to prevent spreading fire. In addition, they self-extinguish as soon as the ignition catalyst is removed. Many fabrics that claim to be fire-resistant have not been proven under real-world condition. When considering FR garments, look for fabrics with a history of flame-resistant and supporting documentation of their performance. 2. Garments made of FR fabric may not alone prevent burn injury. Although flame-resistant fabrics inhibit the spread of fire, the wearer may still experience burns in the immediate area of the ignition point. The advantage of FR garments is that the fire will not spread readily away from the point of ignition and the fabric self-extinguishes soon after the wearer moves away from the ignition trigger. Self-extinguishing fabrics help to limit the extent and area of burn injury. The worker may want to wear T-shirts or undergarments made of FR fabric under their outer garments for added protection. 3. Repellency performance is a critical factor for FR fabrics. Many people assume that the government requires clothing fabrics to repel flames automatically, but this is not true. Fabric is categorized into three groups based on its flammability. Class 3 fabrics burn faster and ignite more readily than do Class 1 or Class 2 fabrics, therefore Class 3 fabrics are not used in clothing. Fabrics used in FR clothing have undergone additional treatment or special weaving processes to increase their ability to resist ignition and repel flame, or are inherently FR by design. 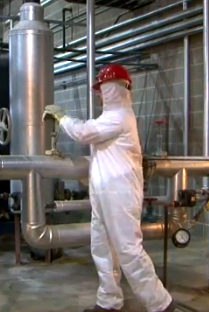 No one should ever rely on standard garments for protection when in a hazardous environment. 4. Only undergarments made of non-melting fabric should be worn under FR garments. Sometimes people assume that since they are wearing FR garments they are completely safe from injury, but no garment offers 100 percent safety. Even FR fabrics ignite and burn at the point of ignition, although they prevent flames from spreading away from the ignition point. It’s important to wear non-melting undergarments under flame resistant clothing in case the outermost garment ignites. Flammable clothing worn under FR clothing could ignite at the burn point and cause serious injury. Fabrics that melt at high temperatures are especially dangerous because they adhere to the skin and cause severe burns. Wearing only flame resistant undergarments helps to increase the margin of safety of the outermost garment. 5. Secondary FR disposable clothing is meant for limited use and should be used over proper primary FR protective clothing. Workers and employers should never rely solely on disposable FR garments for protection. These garments are designed to provide an extra layer of protection when worn over more costly primary protective garments. It’s also important to abide by the manufacturer’s guidelines for use, durability and disposition of disposable garments to ensure workers have the expected range of protection. Flame resistant clothing comes in a variety of styles and fabrics. The most important aspect of secondary FR clothing is to ensure that it offers appropriate repellency and the necessary degree of protection for the workplace environment. It’s easy to believe misleading information or marketing hype about repellency and flame resistance, but prudent employers and workers do the necessary research to ensure the garments chosen to protect valued assets have proven performance.